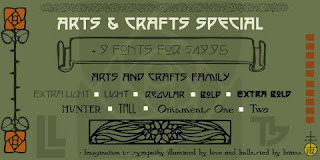 The entire selection of P22 Arts and Crafts fonts is available together for the first time. The Arts and Crafts selection of fonts consists of three titles and a total of 9 single fonts- the Arts and Crafts Set, Arts and Crafts Family and the Dard Hunter Set. The original P22 Arts and Crafts Set was produced in association with The Burchfield-Penney Art Center (Buffalo, New York) and was derived from Roycroft books and periodicals designed by multi-faceted artist Dard Hunter in the early 1900s. The alphabet is an all-caps based on Dard Hunter's famous Viennese style lettering which has become synonymous with the Roycroft movement. The Arts and Crafts Family, sold separately, is an expansion to the Arts and Crafts Set and includes 4 additional weights- extra light, light, bold and extra bold, for more design possibilities. The Dard Hunter Set features two additional authentic Dard Hunter designs, Hunter and Tall, from his Roycroft era (1900-1910) and is authorized by his grandson, Dard Hunter III. Two sets of ornaments accompany the Arts and Crafts and Dard Hunter sets that further enhance a unique and distinguished mission-style appearance. The P22 Arts and Crafts Family Special contains 9 fonts in basic OpenType, PostScript and TrueType formats and can be downloaded for the special price of $49.95 (reg. $129.85 for all 3 sets or $179.55 if purchasing the nine fonts in this special individually). To order the P22 Arts and Crafts Family Special, click here.